A large area of modern Pembrokeshire forming an east-west band along the northern edge of Mynydd Preseli, within the medieval Cantref Cemaes, Uwch Clydach commote. Cemaes was brought under Anglo-Norman control in c.1100 by the Fitzmartins who retained it, as the Barony of Cemaes, until 1326, when they were succeeded by the Audleys. The Barony was conterminous with the later Hundred of Cemais, which was created in 1536, but many feudal rights and obligations persisted, some until as late as 1922. 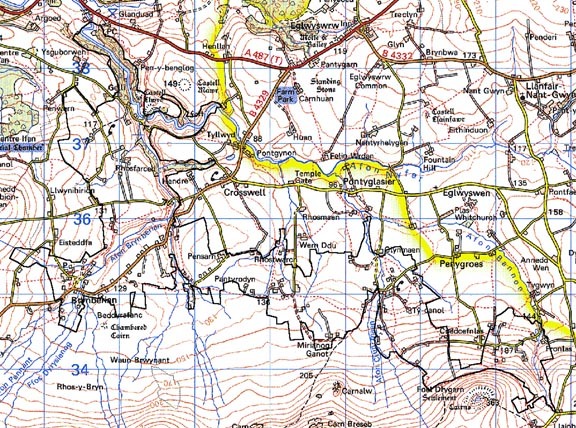 This character area lies within Nevern, Meline, Eglwyswen and Llanfair Nant Gwyn parishes. Nevern parish was a borough of the barony, while Meline and Eglwyswen (Whitchurch) - within which Llanfair Nant Gwyn formerly lay - were held immediately of the Lords of Cemaes. The character area forms the northern edge of the great moorland common of Mynydd Preseli, on which the freeholders of Cemaes held rights of pasture and turbary from the late 13th-century. 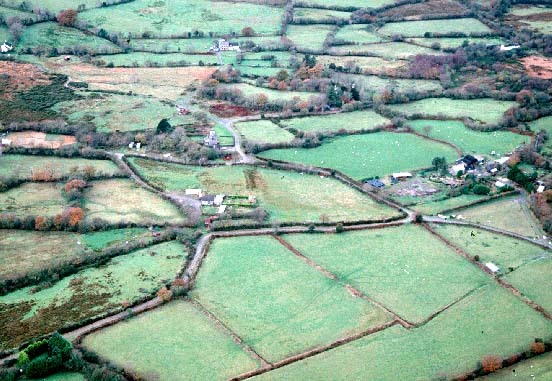 The area has been settled since at least the mid 14th-century, when the vills or farmsteads of 'Melinay' (on the fringe of Preseli), Rhosyfarced and Rhosdwarch were mentioned. The entire area comprises smallish rectangular enclosures of irregular form which suggest that - with the exception of Brynberian - it was all systematically enclosed during this period, rather than as the result of piecemeal encroachment onto common land. However, the tithe maps of 1841-3 label some fields and settlements, along the fringe of the common as 'encroachments', indicating that they were newly established. The moorland boundary is also shown as more irregular than today. The many isolated fields shown just outside the enclosed land on the tithe maps, either have been incorporated within the enclosed land or abandoned. Of the other major farmsteads, Mirianog is also early and is first mentioned in 1412 when 'the messuage of Breuanog-fawr' was granted to Owain ap Gwilym Ddu of Henllys; it comprised 2 messuages in 1786, and 4 in 1950. Helygnant was in existence by 1515, and comprised 2 or 3 tenements each of around 15 acres which in 1597 were owned, as 'Lygnant' or 'Plas Helignant', by Thomas Griffith ap Ieuan Jenkin of Mynachlog-ddu, yeoman, and had by the 18th century been acquired by the Warrens of Trewern. The remainder of the farms were established in the 18th- and early 19th-century. The character area has been crossed by the main Haverfordwest-Cardigan route since the medieval period, via Brynberian bridge which was mentioned, as 'Pont llin birian', in c.1600. The road was later turnpiked and is now the B4329. Settlement at Brynberian occurred around an area of unenclosed common, and appears to have origins after the Independent Chapel was established in 1690. Though the village is of no great size it is now the largest within this character area, having been promoted by the small woollen factory that was operational here during the 19th century. Brynberian - Mirianog historic landscape character area is a wide band of enclosed farmland bordering the northern side of Mynydd Preseli. The general trend of the land is a downward slope from north to south, from over 200m down to approximately 120m, but included in this area is the narrow gorge-like valley of the Afon Nevern and Afon Brynberian and an east-facing shelf of land to the west. Fields are small and irregular. A mixture of boundary types is present. All contain a proportion of stone; they range from dry-stone walls on the eastern side of the Nevern/Brynberian valley, through to stone-faced banks, stony banks and earth and stone banks. Some bank foundation stones are massive and could be termed monoliths. Most banks are topped with hedges, but apart from those alongside roads and tracks and in a few of the lower-lying areas, these are not well maintained. At higher levels hedges are entirely absent; most are either overgrown or reduced to lines of straggling bushes and small trees. Deciduous woodland on the steep valley sides and small stands of scrubby woodland together with the overgrown hedges lends a wooded aspect to parts of the landscape, particularly the Nevern/Brynberian valley. Agricultural land-use is almost entirely pasture, the greater part of which is improved, but unimproved grazing is present as well as tongues of wet rushy ground extending out from Mynydd Preseli. The settlement pattern is of dispersed farms, cottages and houses, with a small, loose clustering of dwellings at Brynberian. Most dwellings are 19th century of one, one-and-a-half and two storeys. They are stone-built (cement rendered and bare stone), slate roofed and of three bays. Rarer house types include a two storey stone built dwelling in the polite Georgian style. Some mid-to-late 20th-century brick built houses are also present as well as other late 20th-century houses. Farm outbuildings, where present, are also quite small. Usually a single 19th century stone-built range is present, sometimes in combination with a mid 20th-century corrugated-iron structure and/or small late 20th-century steel, asbestos and concrete buildings. There are several deserted farms and cottages, particularly on the fringes of Mynydd Preseli. Also in this area are Rhostwarch house and outbuildings, probably of 18th century date and both Grade II listed, an 18th- or early 19th-century pigsty at Maenoffeiriad which is also Grade II listed, Brynberian Independent Chapel, established 1690, rebuilt in 1808 and 1843, and restored in 1882, also Grade II listed, and Brynberian woollen factory which has closed but the mill is Grade II listed. Brynberian bridge had been established by 1600 when it was mentioned by George Owen. Apart from the B4329 which crosses the eastern end of this landscape, other transport elements consist of winding lanes and tracks flanked by high boundary banks. Recorded archaeology is fairly diverse. It comprises a possible neolithic chambered tomb and a group of neolithic and bronze age findspots, a possible standing stone, round barrow, and another findspot from the bronze age. There are two scheduled iron age hillforts, one with an associated prehistoric findspot. There is a dark age inscribed stone, and a possible enclosure? ('bangor' place-name). The medieval settlement of 'Melinay' stood on the fringe of Mynydd Preseli, several kilometres south of the parish church named from the settlement, and its name may therefore be derived from medieval windmills. At nearby Mirianog is a possible medieval corn-drying kiln. Post medieval features include quarry features, mills, wells and bridges. This historic landscape character area is very well defined. To the south it is bordered by the open moorland of Mynydd Preseli, and to the west, east and north lies the lower-lying richer farmland of Eglwyswrw.